When is the Right Time for Power Mobility? Independent mobility is essential for cognitive and psychological development for children of all ages and abilities. 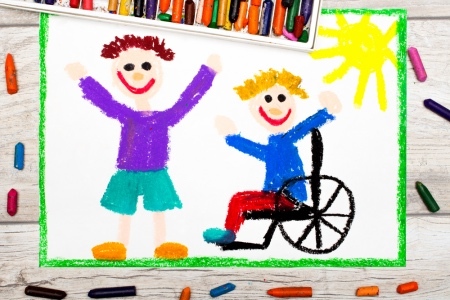 For some children with disabilities, power wheelchairs are the only way they can achieve this independence. They can be used for individuals who are unable to walk, maneuver a manual wheelchair or who don’t have the endurance to walk long distances. Power mobility can come in many different forms, from a typical electric wheelchair or scooter, power standing frames to a toy electric car that has been adapted. People of various abilities can use a power wheelchair and the controls can come in many different forms from a typical joystick, to using their breath or even using as little as using their eye gaze. These technologies have helped people who may not have the ability to be independent to now be independent. When is the right age to start power mobility? Often the question arises as to when is the right time to start using power mobility. Studies have shown that you can use a power wheelchair as young as 14 months to enhance development and function—And some feel that you can start when a typically developing infant begins to crawl. In the past, it was thought that a power wheelchair was the final option once all other forms of mobility had been tried, but there has been a shift to using power to support development, exploration and participation for infants with a wide range of disabilities. Why is independent exploration so important? First off, the child must have the desire to move. Before starting power mobility there are some basic skills your child must have. The minimum skill that your child will need is to have is the concept of cause and effect leading the concept of stop and go. This skill is enough to start the child using an electric toy car that has been adapted with a simple switch and supports. Check out http://sites.udel.edu/gobabygo/ for more information. The “Go Baby Go” cars were started by at PT at the University of Delaware and are a fantastic means to introduce a child to their first form of electric mobility and allow for independent movement at this stage in their life. Further skills required are directional concepts, which will help with the ability to use a joystick. They may not start with accuracy but with practice and perhaps using games they can learn. This skill will allow the use of a typical power wheelchair with joystick. These higher-level skills will allow for further independence with power mobility. I think my child is ready, what do I do now? If your child is receiving physical therapy, speak to your therapist. If they are not receiving physical therapy discuss options with your pediatrician.